WELCOME TO THE OFFICIAL GOLDEN NORTH SALMON DERBY WEBSITE! Due to short and long-term conservation concerns, the Department of Fish and Game and the Territorial Sportsmen do not want to encourage anglers to target king salmon. For 2018, the Golden North Salmon Derby will not be accepting King Salmon for prizes or to be sold as scholarship fish. Results will be posted here on Wednesday, August 22nd. Prize winners or designated representatives must attend the awards ceremony. Winners must present their entry and weigh-in ticket stubs at the ceremony in order to claim their prize. Winners of the Scholarship Fund Prizes and Special Prizes must show their scholarship ticket to claim their prize from Territorial Sportsmen, Inc. at the awards ceremony. Drawing will be done after the derby and prize will be available at Awards night. Winners must have their derby ticket with them to collect the prize. The first 72 contestants catching the largest salmon will have their choice of any one of the prizes except that first prize goes to the largest fish and prize number 72 is reserved for the person catching the 72nd top weight. With the exception of the 1st and 72nd place prizes, the 2nd place finisher gets his or her choice of any remaining prize, then the 3rd place winner and so forth, until all prizes are claimed. Only one of the top 72 prizes will be awarded to each contestant. In case of a tie, the earliest entered weighed fish will receive the highest standing. If winners or their designated representative are not present on awards night to claim prizes, unclaimed prizes will revert to the derby committee. 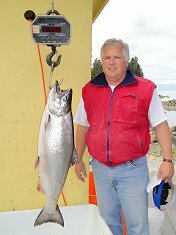 64th Golden North Salmon Derby winner TED QUINN won with a 26.0-lb King!! The Golden North Salmon Derby is a fun filled summer fishing event that began in 1947. People from all walks of life in the community participate. Families, people (young and the young-at-heart) that love to fish, and even some who don't but want to support the purpose of the Derby spend the week-end in pursuit of Kings and Cohos and the chance to compete for the prizes generously donated by local businesses and individuals. Those that turn in fish that are not competing for the top "weightiest" fish receive thank you prizes in appreciation for providing these fish to sell for scholarships for Juneau's young people. The proceeds from the sale of these fish minus the expenses of cleaning and handling are given to the Territorial Sportsmen Scholarship Foundation. Since 1953 the Territorial Sportsmen Scholarship Foundation has awarded 305 scholarships totaling over 1.7 million dollars to deserving young people. Four year scholarships for graduating High School seniors are available as well as scholarships for graduate study. Scholarships for vocational training are available as well. Please join us in investing in our young people! Alaska Airlines - The Official Airline of the Golden North Salmon Derby! © Territorial Sportsmen, Inc. All rights reserved.